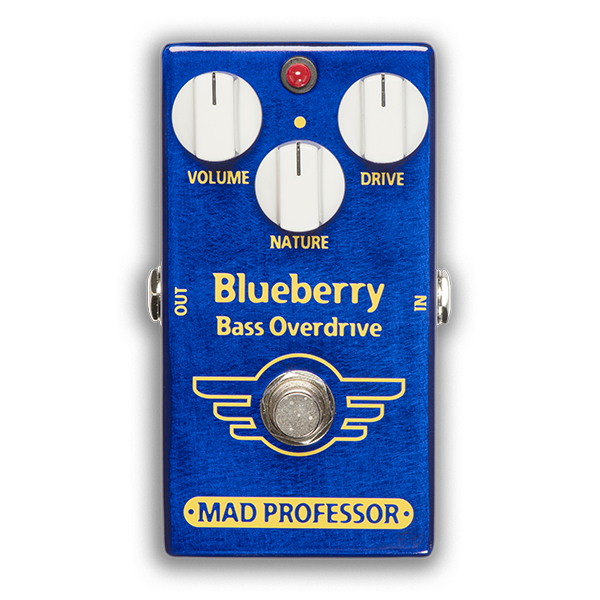 A high-quality dynamic overdrive pedal for electric bass. CONTROLS VOLUME: controls output. DRIVE: sets the amount of distortion and sustain, as well as the type of distortion. lower settings give dynamically controlled overdrive, the unit distorts more the harder you strike the strings and there is no definite clipping point, but rather different shades of distortion as the amplitude changes. Higher settings will give more compressed sounds. a good starting point with most basses is fully CCW, turn the knob until you find the overdrive level that suits your playing. lower settings are good for old school tube amplifier tone, while higher settings give denser distortion. NATURE: is a tone control for filtering and to control what register distorts. Turning CCW gives more low-end and also distortion in the lower registers. Turning CW gives an emphasis in the upper midrange for more protruding solo bass tone. ELECTRICAL SPECIFICATION Input impedance: 500K Ohms Recommended load: 50K Ohms Current consumption: 4 mA at 9V Max gain: 50 dB at 1KHz Supply voltage range: 8-12V’s True bypass POWER REQUIREMENTS 6F22 9V battery or DC eliminator 2.1 mm plug.